Each month I attend a book club with several women, most of whom are at least 20 years my senior. Those in my club have various tastes in books. Some like books with substance and literary value, others just want to read for enjoyment. Choosing a new read every month isn't easy. However, I had no qualms about recommending the title for this July. 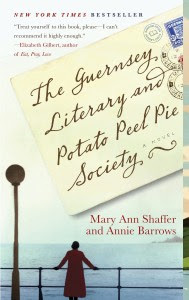 I suggested The Guernsey Literary and Potato Peel Pie Society (Random House Reader's Circle) by Marie Ann Shaffer and Annie Barrows. I had read the book myself a year ago when it first came out and now, since its recent release in paperback, I thought the ladies in my club might find it interesting and easily obtainable. Really, who can resist such an original title? The novel takes place in England and the Channel Islands in the year 1946, right after the end of World War II. Written with an unusual style, the book uses fictional correspondence in the form of written letters between the characters. Juliet, a popular newspaper columnist living in London, wants to write a new book but finds herself struggling to come up with an interesting subject. By some fortunate miracle, a gentlemen by the name of Dawsey Adams from Guernsey (part of the Channel Islands) writes a letter to her. He gained possession of a book once owned by Juliet, noticed her address inside and decided to send a note to her asking for help in locating a bookshop in London. It is from this letter that Juliet first learns of The Guernsey Literary and Potato Peel Pie Society, a book society Adams and his neighbors formed mostly by accident during the German occupation. Thinking that the society would make a wonderful subject for her next project, Juliet asks the members if they would be willing to correspond with her and tell her more about the society, their love of books, the island, and their lives. As she works to write a book that shows the heart of the society, she tries to make sense of her own heart as well. Every single member of my book club loved this novel. We loved the rich, real characters, the spectacular setting, and the amazing historical background depicting the strength and suffering of those living in Guernsey during the German occupation. Now, I'll mention the book is a bit of a slow starter. Keeping track of the characters isn't easy initially and the writing style involving letters tends to be a little hard to follow at first. But do try to make it through the first letters because the the story is well worth reading. Not one of the members of my club, not even those that lived through World War II, realized the history involving the Channel Islands. Additionally, our group wistfully discussed the art and appeal of written letters. Isn't it a shame that more don't correspond by mail today? Email just doesn't offer the same experience. Mary Ann Shaffer obviously spent a great deal of time researching wartime experiences in Guernsey. With the help of her niece, Ann Barrows, she was able to author a wonderful, moving book full of marvelous expressions and interesting, varied characters. Win a copy! This review is part of TLC Book Tours, and Random House has kindly offered to giveaway up to (5) copies of The Guernsey Literary and Potato Peel Pie Society to Brimful Curiosities readers. 5 COPIES! (1 copy for every 20 comments) Tell your friends about this one. To enter, leave a comment relevant to the post or let me know the last time you penned a written letter (no, thank you notes do not count :) ). • Contest ends on Monday, August 24th, 2009 at 11:59 PM CST. Oh, I KNEW there was a reason I was up this early! I SO MUCH have wanted to read this book! I am a blogger and want to win SO MUCH! Thanks for the chance! And of course I am an OLD follower...I'd tweet by don't know how...sorry but thanks for the chance at this book! The last time I penned a written letter was yesterday!! Wow. It's been a really, really long time since I penned a letter. Goodness! To be honest I was probably still a teenager or even a tween. I really would love a chance to read this book though because I love to read letters even if I'm not too great at writing them on paper. Do Christmas letters count? At least the handwritten notes on them?! I am a follower & a subscriber. No need to enter me, as I've already read and loved this book. I agree that it's sad that letter writing has fallen to the wayside in favor of email. Glad to see you loved this book, too. Would it be okay to link to your review on War Through the Generations? Don't enter me, but I just wanted to thank you for such a thoughtful review! I'm glad the ladies in your book club enjoyed it. It *is* a shame we don't correspond via handwritten letters like we used to. One of the casualties of being busy busy busy. The last letter I wrote was to my husband while he was in Navy boot camp. My bookclub picked this one for this month. So, I'd love to win it! My 6yo loves to write letters and send them out. Last Christmas was probably when I penned a real letter to my freshman Literature professor! I follow and also subscribe via google reader! I am intrigued by the sound of this book. Sounds like just the type of thing I love to read. I'd love to win! I wrote my friend a very long letter with her birthday card last month! I admit to jumping at any chance I have to add a written letter to any cards, etc leaving our home! When my daughter was in 5th grade I wrote her letters each week for school. It's fun to go back and read them, along with the ones she wrote to me. This is a great giveaway. I've only heard good things about the book and would love to read it. I am a subscriber and would like to win this book. I feel like I'm the only person left who hasn't read this! I suggested it to my book club but it was turned down because so many people had already read it, and everyone recommended it highly. The advance buzz is so high! I'd really love to have this. Thanks for sharing it!! The last time that I actually penned a letter...hmmm....possibly to my Grandma, when my boys wanted to send her pictures that they drew? That would have been about a year ago. Please enter me into your contest! I'd love to read this book. Please enter me. Thanks. I'm not much of a letter writer, so if I had to guess when I last wrote a letter that probably would have been 20-30 years ago. Thirty-five years ago when my sister moved away for about a year. I haven't penned a written letter since before I got a computer. It's probably been 15 years or better. The last time I wrote a letter was months ago - to my father who lives abroad. When we speak long distance, it's often rushed with the 12 hour time difference. It's more satisfying to write a letter, even though he never really writes back! I've been wanting to read this for awhile! Thank you for the chance to enter. :) I write small notes in with packages occasionally, but I think college was the last time I wrote a real letter. Oooh, I want this one so badly! Please enter me in the drawing, please please. Thanks for hosting such an awesome contest. the last time I actually wrote a letter was the beginning of July to my friend Carol. She is computerless. Imagine that! So I wrote her a big letter for her 70th birthday. The last time I penned a written letter would be 2007. The last time I penned a letter was in June. I have friends that live in different European countries. For us, communication is more personal with a pen. Wow. Do long cards count? I can fill up a birthday card in no time.... but I haven't written an actual letter in probably 5 years! It was only about a month ago. I sent a friend a letter with a box of presents for her birthday. I follow on Twitter and here is my Tweet: http://twitter.com/morbidromantic/status/3293125049. I sent my best friend a happy birthday/how are you? letter last month. The last time I wrote a real letter was probably around Christmas time. (Yikes!) I guess I should add it to my to do list! I do love to write letters and send them snail mail. I just hope my recipients appreciate them! The last time I wrote a letter was last summer. It was a business letter. Personal letters seem to be a lost art for me and I assume for many others. I penned a couple of letters last Christmas. This is a book that I have really wanted to read since I read an earlier review of it. The last time that I wrote a letter that I can remember was when I wrote a letter to my mother and telling her how much she meant to me and what a wonderful role model she was to me. My mother passed away about three years after that letter. I write letters to my work clients, hope that counts! I acutally just wrote a letter last Thursday to a friend who was moving. I penned a letter last week. I sometimes put a letter in my husbands lunch when I pack it. The last letter I wrote was to my sister. It was written about a month a go. I admit, I do most of my correspondence by email. This sounds like good book. Thanks or the chance to win! I mostly use email - apart from the occasional card, I can't even remember the last time I wrote an actual letter (well, I think it was in high school). This book sounds really good. I would love to read it. Please enter me. Thanks! This book looks great - it's been on my "must read" list for a while now. And the last time I penned a letter was sooooo long ago I can't even remember. When I was a child, we moved and I always wrote letters to my old friends. One in particular wrote back & forth with me all the way until college. I think penned letters are the best. I wrote to my brother a few months ago. I also have my kids write to their great grandparents. I love the art of letterwritting...I wrote a letter on Friday to a friend who lives miles away. Would absolutely love to read this book...thanks for the opportunity. I've been waiting for a copy of this book from the library,so I would love to win a copy. The last time I can remember writing a letter, it was with my sister's Christmas card. Oh gosh, if thank yous don't count, I couldn't tell you. It's been years! WOW!! If I can't count thank yous or quick notes in Christmas cards, I'd probably have to go back to COLLEGE! I used to write my parents letters, but you don't want to know how long ago that was LOL! I've heard great things about this book and would love to win.